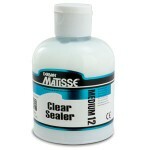 Clear Sealer - 250ml. Specially formulated for folk art techniques.MM12 Clear Sealer can be used on raw wood if you are not using a Matisse Background Colour (which has a built-in sealer) and want to paint a design on the raw wood leaving the natural grain revealed. 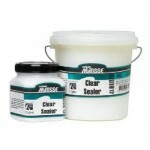 It can also be used on glass, ..
Clear Sealer - 1L. Specially formulated for folk art techniques.MM12 Clear Sealer can be used on raw wood if you are not using a Matisse Background Colour (which has a built-in sealer) and want to paint a design on the raw wood leaving the natural grain revealed. It can also be used on glass, cer..
Gel Medium - 250mlModern paint technology has facilitated the production of a true Gel Medium. 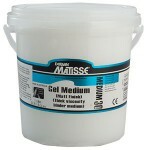 The purpose of the MM4 Gel Medium is to act as a clear transparent colour extender in the production of brilliant coloured glazes and as a transparent impasto for thick 3-dimensional brush and knife app..
Gel Medium - 1L.Modern paint technology has facilitated the production of a true Gel Medium. The purpose of the MM4 Gel Medium is to act as a clear transparent colour extender in the production of brilliant coloured glazes and as a transparent impasto for thick 3-dimensional brush and knife appli..
Impasto Medium - 250ml. 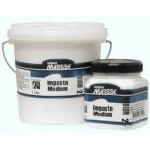 MM2 Impasto Medium is a full-bodied texture paste and modelling compound. It may be thought of as a “heavy-bodied paint”, free of colour pigmentation (however, it is not clear).This medium dries to a low subdued sheen which is similar to the sheen on a dried paint film of ..
Impasto Medium - 1Lt. 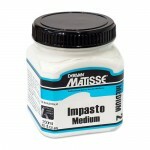 MM2 Impasto Medium is a full-bodied texture paste and modelling compound. It may be thought of as a “heavy-bodied paint”, free of colour pigmentation (however, it is not clear).This medium dries to a low subdued sheen which is similar to the sheen on a dried paint film of Ma..
Iridescent Medium - 250ml. MM24 Iridescent Medium is formulated to be mixed with the Matisse Structure or Flow Formula acrylic paints to add an iridescence (metallic sheen) to them.This medium can be mixed in any proportion with Matisse Colours.MM24 Iridescent Medium is based on pure iridescent p..
Iridescent Medium - 1L. MM24 Iridescent Medium is formulated to be mixed with the Matisse Structure or Flow Formula acrylic paints to add an iridescence (metallic sheen) to them.This medium can be mixed in any proportion with Matisse Colours.MM24 Iridescent Medium is based on pure iridescent pigm..
Marbling Gel - 250ml. Use MM16 Faux Finish & Marbling Gel with Matisse Flow Formula Acrylic colours for a thicker and more transparent consistency. Also can be used for additional painted finishes and various marbling techniques.For painted finish techniques, mix MM16 Faux Finish & Marbli..
Matte Medium - 250ml. This is an additive for intermixing with Matisse Colours (not a finishing varnish). Incorporation of the medium within the paint will reduce the sheen of Matisse to a very flat or low sheen finish suitable for work to be photographed. Resultant dried films of Matisse Colours..
Matte Medium - 1L. This is an additive for intermixing with Matisse Colours (not a finishing varnish). 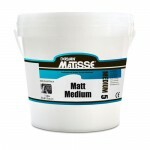 Incorporation of the medium within the paint will reduce the sheen of Matisse to a very flat or low sheen finish suitable for work to be photographed. 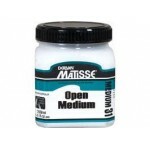 Resultant dried films of Matisse Colours wi..
Open Medium - 250mlMM31 Open Medium is formulated to be mixed with either Matisse Structure or Matisse Flow acrylic colours to assist in prolonging drying time while maintaining the consistency of the paint. 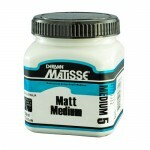 When mixed with Matisse Structure, they will retain their impasto quality, while Matisse ..
Painting Medium - 250ml. MM9 Acrylic Painting Medium is a pure acrylic binder used in formulating Matisse Colours and acts as the principal paint “dilutant” when not using water.Water may be used with the Matisse colours. However, the addition of more than 30-50% water to Matisse Colours will red..
Painting Medium - 1Lt. MM9 Acrylic Painting Medium is a pure acrylic binder used in formulating Matisse Colours and acts as the principal paint “dilutant” when not using water.Water may be used with the Matisse colours. However, the addition of more than 30-50% water to Matisse Colours will reduc..
Polymer Gloss Varnish - 250mlMM7 Polymer Gloss Varnish & Medium serves both as a gloss finishing varnish and as a glossy additive to the paint. Mixed with Matisse Colours, it increases gloss and flow characteristics. 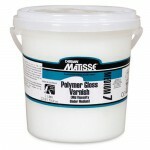 Used as a finishing varnish, it produces a strong, protective, tack-free, cl..
Polymer Gloss Varnish - 1L. MM7 Polymer Gloss Varnish & Medium serves both as a gloss finishing varnish and as a glossy additive to the paint. Mixed with Matisse Colours, it increases gloss and flow characteristics. 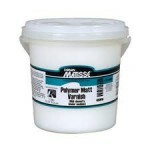 Used as a finishing varnish, it produces a strong, protective, tack-free, cle..
Polymer Matte Varnish - 250mlMM6 Polymer Matt Varnish can be used as a final varnish over a dried, well-cured acrylic painting when a flat, matt or very low sheen is required (and the use of MM15 Matt Varnish (turps-based) is not appropriate).Most suitable as a protective coating particularly ove..
Polymer Matte Varnish - 1L. MM6 Polymer Matt Varnish can be used as a final varnish over a dried, well-cured acrylic painting when a flat, matt or very low sheen is required (and the use of MM15 Matt Varnish (turps-based) is not appropriate).Most suitable as a protective coating particularly over..
Polyurethane Gloss Varnish - 250ml. 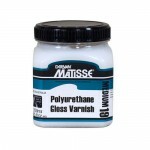 MM19 Polyurethane Gloss Varnish is specially formulated for use in folk art techniques, this water-based finishing varnish provides a clear high gloss non-yellowing finish.For a protective surface coating use direct from bottle.Do not dilute with water.Allow at.. Satin Varnish - 250ml. MM11 Polyurethane Satin Varnish is a very popular varnish used in folk art techniques.Always stir before use to ensure even distribution of the matting agent. 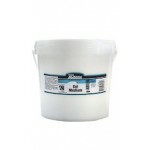 This water-based finishing varnish provides a clear, non-yellowing and hard-wearing finish for all hard surfaces pa..